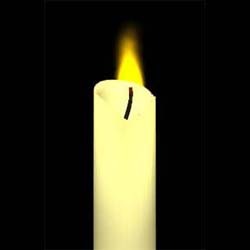 A candle is one of the basic light sources you will need in your scenes, especially when you situate them in the Middle Ages. This tutorial shows how to make the basic shape of a candle and a simple flame. 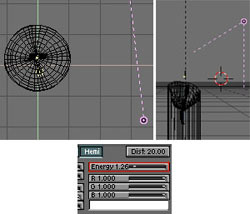 It is supposed that you know Blender interface enought to insert objects and handle them. I wrote this tutorial several weeks ago for Czech Blender begginers and this is the English version of it. Czech readers please follow this link. Start by adding a tube surface in the top view ( ) and make it extended in the right view ( ). You can do this by using box-select ( ) and selecting the top vertices. 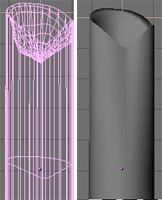 Next, drag the top vertices upward. With the top Control Vertices (CV's) still selected, switch to top view ( ). Extrude by pressing and scale them down with . Repeat this three or four times. Please notice that the first extruded circle is only a little bit smaller than the outer circle for the wax will be thin here. Fix this state by pressing twice. If you are in editmode and want to restore this state later press , but I am sure you knew this. With the border select tool select the middle inner circle and press to activate the proportional editing tool. This tool works like a magnet and when it is activated actions like moving, scaling and rotations affect not only selected vertices but unselected ones within adjustable range as well. There are two modes for the proportional tool - a sharp falloff and a smooth one. You can switch between them by pressing + . Now comes the creative part. By selecting and moving individual CV's with various magnetic ranges, create a crater shape typical for a used candle. Now select the bezier curve again and while still in the Edit Buttons window click on BevOb button and enter the name of circle (see above). The cirvle is now extruded along the path. By scaling the circle you can adjust the wick´s proportions. Let's add some material. For the wick I used a black colored material with Spec and Ref sliders on zero. Add a lamp just above the candle and set it as you see in the picture. This light will simulate the light of the flame as well as giving the impression that the wax is hot around the wick. The second light is of type 'hemi' and its position and settings you can see on picture again. To add a flame to the wick, set up a particle system. In top view add a mesh circle, scale it down to the wick size and place it where the wick meets the wax. Then in the Anim Buttons window ( ) click on NEW effect button then on Build button. Change it to Particles. Here you'll find the settings for the particles. Buttons signed red are relevant. When you press you should see how the particles flowing from the circle. But when you try to render it, it is still far away from looking like a flame. To make the flame realistic we will create a suitable material for the particles. First select the circle emitor and add a new material to it. Set the material to a yellow color and turn the Halo button on. Then set halo size. I used 0.60 but it depends on candle size. You may have to try to render it several times to find right value for you. Now the flame should have the right color but its shape is still not not perfect. 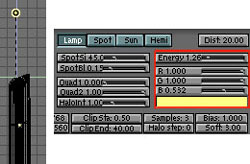 For a more flame like shape we have to use Ipo editor to change the transparency of the particle during its lifetime. Because the life value for the particles is set to 50 we will make the material almost transparent for this frame. To do this leave the circle emitor selected and press or click on button. The Ipo editor will appear. In the Ipo editor you can animate Loc Rot and Size of objects, vertex keys, sequences ipos and for us the most important for now: material Ipos. To switch to material ipos click on the image of the ball at the bottom of the Ipo window. In the left columm you can see all the animateable material parameters. Click on the Alpha parameter for we want to adjust transparency for material. The X axis now defines the frames and the Y axis the value of a parameter. By pressing you can add new Control Vertices into the Ipo editor. Add two CV´s, press to jump into edit mode and select first CV. Press to activate number buttons and insert values LocX=0; Loc y=100. Handle second CV similary. Values will be Locx=100, Loc y=0 so you´ll get mild gradient for alpha. Jump out of edit mode now and render scene. When creating IPO's for particles, each particles' lifetime is mapped onto 100 frames in the IPO editor. So even if your flame particle only lives for 50 frames, make sure that you define the alpha curve from frame 1 to frame 100. That´s all. For better results you may play with the material settings and particles settings. You can also add one more particle emitor with slightly different settings from the first flame and add to it smoke material. This tutorial is translated from czech original on server www.grafika.cz.